Michael Roesh : Hi, I´m Michael Roesch, and I´m one of the directors of the new vampire movie "BROTHERHOOD OF BLOOD". Peter Scheerer : I´m Peter Scheerer, and I´m the other director of "BROTHERHOOD OF BLOOD". P.S. : We always wanted to make movies. We became friends when we were in school, and started to shoot horror movies with an old Super 8 camera when we were 12 years old. M.R. : Later we started to write scripts. And we were very lucky - we were able to sell all our scripts. M.R. : As a kid, movies like "STAR WARS" and the Indiana Jones movie influenced me, I wanted to become a film maker after I saw them. From the directors, for sure Spielberg influenced me most, but also Cameron. Oh My Gore : "Could you talk us about your collaboration together ? You seems to be inseparable (You even share the same website ! ), where did you meet and what made you decide to work together ?" P.S. : We knew each other from school, and started to shoot movies together. Later we worked as screenwriters, and went from there to directing. M.R. : We like the same kind of movies, and so we started to shoot movies ourself. And directing a movie is so much work, that you sometimes wonder how other directors manage it, who do it alone. This is maybe the reason why you see more directing teams today - like the Coen Brothers or like Rodriguez/ Miller for "SIN CITY". Oh My Gore : "Before talking about your coming "BROTHERHOOD OF BLOOD", we will speak about previous movies you've worked for : "ALONE IN THE DARK" (1 & 2) & "HOUSE OF THE DEAD 2". Are you consiencous that you wrote, with "ALONE IN THE DARK", the script of one of the worst motion picture of the 2000s ?" M.R. : The problem with "ALONE IN THE DARK" was, that one of the producers hired another writer, who wrote a completely different script, and they mixed it randomly with our script, and had in the end one script that was not working. P.S. : In the finished movie there are 2 or 3 scenes from our original draft. We would be happier if they would have used our original script, but on the other hand we are very happy and grateful for the possibility to break into the business. There are so many screenwriters who try it and never make it, so we were very lucky. Oh My Gore : "You also writed & directed the sequel, can we expect something better :) ?" M.R. : The sequel is closer to the mood and the feeling of the game, so we hope the fans will like it more. P.S. : The reviews can´t get any worser than for the first part. Oh My Gore : "A sequel for "ALONE IN THE DARK", another for "HOUSE OF THE DEAD", what did you think of all these sequels, prequels & remakes we can find on screen nowadays ?" P.S. : Many of these sequels and remakes are made by the studios for business reasons. The film business is very risky, and sequels and remakes are movies were you know that you will make profit. M.R. : A movie like "ALONE IN THE DARK 2" or "HOUSE OF THE DEAD 2" is selling much more DVD´s than a non-sequel movie with the same budget. It's part of the business. Oh My Gore : "Do you think yours can add something to the orignals movies ?" M.R. : I think our story is a little bit closer to the game, so we hope that the fans like it. P.S. : It has a much smaller budget. So we were forced to make the movie smaller and more intimidate. So it's more about the characters than the special effects. Oh My Gore : "How is your relation with Uwe Boll ? You've collaborated with him on a lot of projects." M.R. 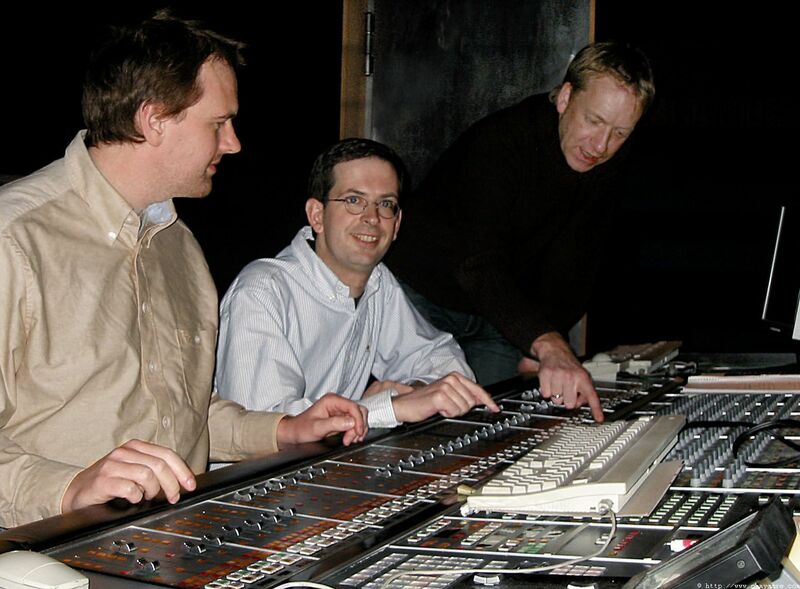 : Yes, we have worked with Uwe on several movies, and are friends with him since a long time. Many people are surprised when they meet him in person - he is very funny, very smart and a real nice person. P.S. : And you can learn a lot of things from him. Things you should do and things you maybe should not do. Oh My Gore : "What do you think about this anti-Boll campaign we can see on internet ?" P.S. : Sometimes you think "Come on, he is only doing movies - he is not building weapons of mass destruction"
M.R. : I think they went too far. But in the last few month I had the feeling that the things changed a little bit, as many people were surprised about Uwe´s new movies like "TUNNEL RATS". Oh My Gore : "Except for "BROTHERHOOD OF BLOOD", all your movies are based on a video game, are you big video game players ?" M.R. : I´m not the big video game player, but Peter is. P.S. : So it's strange when somebody asks you to write a script to a game you played long time ago and you suddenly become a part of this game-world. Oh My Gore : "What inspired you to write "BROTHERHOOD OF BLOOD" ? P.S. : We had this idea in our minds for a while, and when we wrote it, we didn´t sell the script, but kept if for our debut as directors. It is a unusual story with a lot of twists, and this is probably what the actors liked as well, and Sam Raimi, who picked up the movie for North America for his new label GHOST HOUSE UNDERGROUND at Lionsgate. M.R. : At the time when we started to working on the script, there were not so many vampire movies - but we wanted to shoot a vampire movie we wanted to see as fans as well as filmmakers. And we were lucky - now, as the movie is ready for it´s release, vampires are again very popular. Oh My Gore : "Can you tell us a bit more about the story of "BROTHERHOOD OF BLOOD" ? M.R. : "BROTHERHOOD OF BLOOD" tells the story of a group of vampire hunters. The hunters slowly become the evil they wanted to fight. We found it interesting to show how the war between vampires and hunters changes the opponents on both sides, and how blind they become for a much greater danger. P.S. : The great thing on vampires is, that everybody knows the rules, so you can focus on your story right away, and don´t need to explain everything. 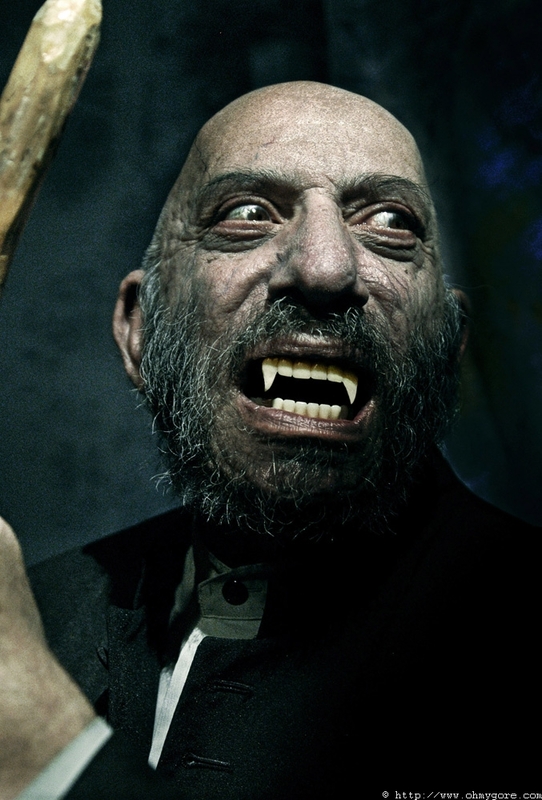 Oh My Gore : "Sid Haig and Ken Foree appears in "BROTHERHOOD OF BLOOD". There are both great names in horror business. How was the collaboration with them and how did they involded in the movies ?" M.R. : It was very cool. We have been fans of Sid and Ken for many years, and we knew that they would be perfect for the roles. So we had send them the script, and only hoped that they would like the script. And we were very happy that both of them liked the script much, and accepted the roles. P.S. : Both Sid and Ken were very professional on the set, extremely well prepared. They never complained, even with our tough low budget shoot. For example, we needed to chain Ken to a very uncomfortable wooden torture table, for 5 days, 12 hours a day, and he has not complained once. P.S. : Our vampires had all problems with their teeth - In the beginning, they were hard to understand, because they are not used to the teeth, but thank god they all got used to it. M.R. : And in the beginning the vampire teeth felt out. But with some glue and some time we got it all fixed. With that many actors getting vampire teeth, we felt sometimes more like in a dentist office than in a studio. M.R. : On a low budget shoot the most difficult thing is the lack of time, so nearly every scene was difficult, as we had not enough time. P.S. : But of course the scenes with more action, like the shootout at the end, are the most difficult - you need so much time to get action scenes right, but you have so little time on a low budget shoot. Oh My Gore : "Did directing your own movies influenced you way of writing ?" M.R. : You certainly get a better feeling what works and what not. Oh My Gore : "Can you tells us a little more about your screenwriting process ? Isn't difficult to write together ?" M.R. : No, we are really used to it, as we work together since a long time. P.S. : It is good if two people look on an idea, instead of one. If one of us has an idea, and the other don´t like it, than it´s probably not such a good idea. If we both like it, than it´s probably not too bad. 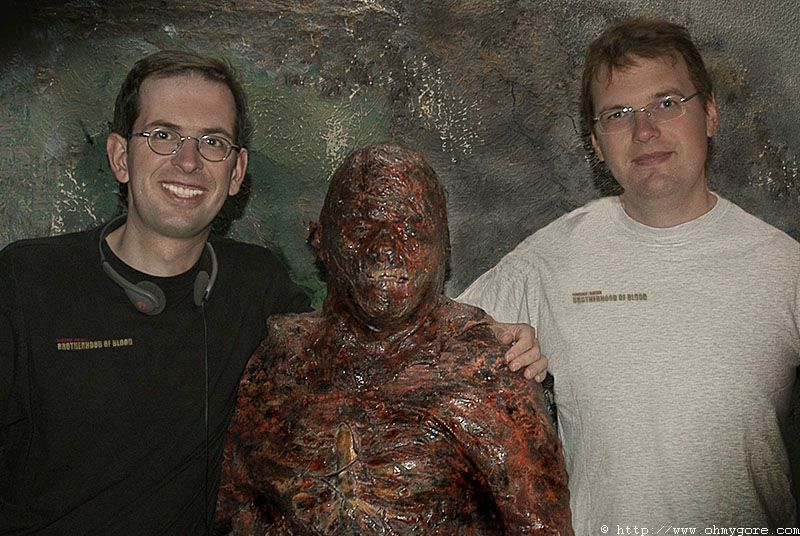 Oh My Gore : "You've both worked as producer, screenwriter, or directors. What do you prefer ?" P.S. : To work as directors. Nearly all screenwriters want to become directors. M.R. : Most screenwriters in Hollywood make the same experience - that your scripts get totally changed by the director or producer. And the best way to get your script on screen as you imagine is, is to direct the movie. Oh My Gore : "You never try acting yet ?" P.S. : We feel more comfortable behind the camera. M.R. : It´s much more fun behind the camera. P.S. : Our next movie as directors will be again a horror movie, but this time with a higher budget. P.S. : The tone and the mood of the movies is different. Like with every genre there is an evolution. M.R. : It is great that there are so many new horror movies, much more than a couple of years ago. But the danger is that too much of the same kind of movies could hurt the horror movies at all - like when there was at one point all the Asian kind of horror movies, or at some point so many zombie movies. M.R. : I like French movies, for example "DELICATESSEN" was great, and also the "BROTHERHOOD OF THE WOLF" was very good. I just saw parts of "VAMPIRE PARTY", which was funny. P.S. : I saw last week "BIENVENUE CHEZ LES CH'TIS". And I found it very funny. I grew up with movies from Luis de Funes. Oh My Gore : "Generally speaking, which are your favorite horror movies ? And the ones that scared you the most ?" P.S. : From the "newer" movies "RING" scared me. M.R. : That´s a long list... But among my favorites horror movies are many classic movies like "JAWS", "ALIENS" and "DAWN OF THE DEAD". M.R. : Always our next movie. P.S. : And a movie with a bigger budget and more time. P.S. : There are many great actors we would like to work with, and we will try to get them for one of our next movies. M.R. : It´s always cool when you can get an actor for your movie, where you have been fan of. 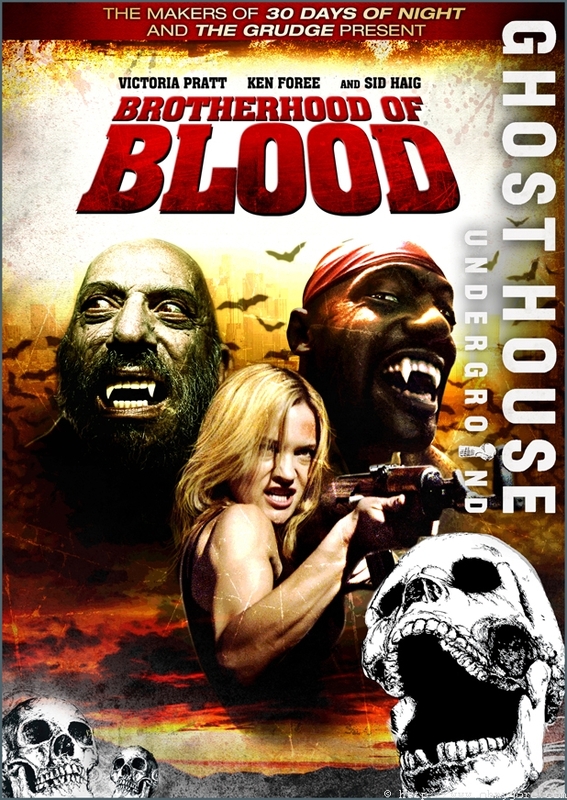 We had Ken Foree and Sid Haig for "BROTHERHOOD OF BLOOD", and Bill Moseley and Lance Henriksen for "ALONE IN THE DARK 2", and it was really cool to work with them. M.R. : I like it much, it has cool news and very interesting interviews. P.S. : It´s cool that it has both English and French version of the articles. M.R. : Thank you for the interview! We hope that you enjoy "BROTHERHOOD OF BLOOD". This page has been seen 3471 times.